February 1956: The Wellpark team that was second in the National at Hamilton: Back Row: J Cairns, B Aitken, S Aitken, D McGivern, C Aitken, S Brown. Greenock had three running clubs when I took up the sport – Greenock Glenpark Harriers, Greenock Wellpark Harriers and a women’s club called Greenock Rankin Park Harriers. All were well established clubs at that point and all were successful clubs. The oldest of teh three was Wellpark (1891) with Glenpark being in 1895 so there was clearly a love of the sport in an area that could support three athletics clubs and that had been going for so many generations. The top men in Wellpark that I was aware of right from the start were the brothers Tom and John Stevenson and George King. George was a very good road runner and a medallist in the marathon while Tom and John Stevenson and team mate Frank Sinclair all won Scottish Cross-Country vests – Tom won six, John and Frank four each. All three were in the Scottish cross-country team at the world championships in 1953. Bill Stoddart who was as exceptional in his own way as any Scottish runner at any time is also part of this band although his true exceptionality was not to become clear for some time, he has his own profile on the website here . Others of note included Frank Whitley and Junior McHenery who died in October 2011. Junior had been a member of the teams in the 1950’s and early 60’s and had been third in the SCCU junior cross-country championships. If we go through the exploits of the club in the 50’s and early 60’s the quality of the club at the time and of the runners will be eminently clear. Remember that at this time Victoria Park AAC, Shettleston Harriers, Bellahouston Harriers and Edinburgh Southern Harriers were all top class outfits as shown by their running in British competition as well as Scottish, and remember too that Wellpark was facing competition within Greenock itself from Glenpark Harriers. 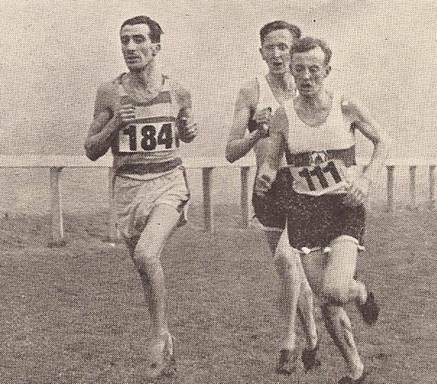 There was no team from Wellpark in the classic Edinburgh to Glasgow road relay race until 1955 when they finished seventh. A notable achievement for a first ever run in the event and would surely have won the medals for the most meritorious performance had it not been for the even more outstanding run by Vale of Leven Harriers. They followed this with second place in the Scottish Cross Country Championships just four months later when Tom and John Stevenson were third and fourth. But we should go back to the immediate post war years to make a proper start. 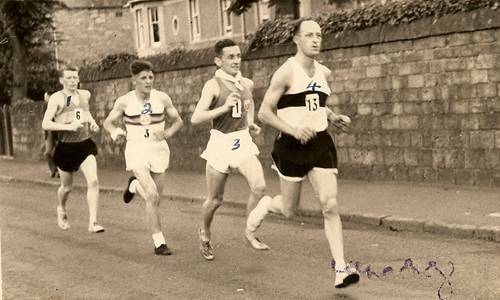 In season 1946-47 Frank Sinclair of Wellpark was fourth in the senior national – only five seconds behind Emmet Farrell in third and 29 seconds behind Andy Forbes in first place. This gained him selection for the International race in Paris on 30th March where Jim Flockhart in seventh led the team into fifth place and Frank finished in twenty eighth to be counter for the team. Emmet, writing in the ‘Scots Athlete’ preview of the SAAA Championships that year said: “An ‘Open’ Mile: A new title holder is certain for this event. Jack Corfield, the holder, being back in England. J Stuart (Shettleston), Geo Lamont (Victoria Park) and F Sinclair (Greenock Wellpark) all have excellent chances as has J Buchan (St Andrews). There is no word at the moment of of James Fleming (Motherwell), at present overseas, but if able to compete I should be prepared to see him win. Stuart is going great guns at the moment and as this ambitious young man trains to schedule as far as business permits, he should be there at the ‘death’. George Lamont, last year’s runner-up, ran a good race in the AAA mile championship last year and cannot be left out of the reckoning. But, in what should be a very open and exciting race, I am prepared to find Frank Sinclair hitting the tape first. “ The brief report on the race itself said that the favourite had been Sinclair, and the result was a win for the Greenock man in 4:27 by eight yards from Lamont. He was subsequently named a a possible Scottish contender for a place in the 1948 Olympic Games team – ‘though possibly not in the Mile.’ There was a triangular contest in Edinburgh between Scotland, England and Ireland and Sinclair ran in the mile where he was third behind the two Englishmen but only 15 yards from the winner. “In 27 year old Frank Sinclair, Greenock Wellpark have developed one of the most colourful runners of the present decade. Finishing fourth in the Scottish cross-country championships with the underfoot conditions not to his liking, was a meritable performance, and as a member of Scotland’s team in the international cross-country race on March 30th, he is capable of running an outstanding race over a course which will be more suitable to him. Frank has a long raking stride, with a free, easy action which catches the eye whenever racing. His all round versatility is demonstrated by his distinctive running over all distances from 880 yards to ten miles. 1947-48 saw the first appearances of Tom and John Stevenson and George King in the officials results with Tom in the senior ranks and John as a Youth. After a poor winter in terms of team results, the National results for the club were encouraging at least. Frank Sinclair was second in the senior race and George Dallas, writing in the ‘Scots Athlete’ had this to say about his finish: Sinclair in a great duel with Craig (Shettleston) just managed to pip his rival on the post, and this must be regarded as a splendid result for one who is particularly good from the half mile upwards.” Sinclair was only 13 seconds and 70 yards behind winner Emmet Farrell who had last won the title in 1938 – exactly ten years earlier. Sinclair was selected for the International at Reading on 3rd April where he finished 53rd. In the Youths race, won by Harry Fenion of Lochwinnoch, John Stevenson was placed fourth, just 33 seconds back and only 10 seconds behind the third runner. In the SAAA Championships in June at Hampden Park, Sinclair was second to Fleming of Motherwell who clocked 4:27.8. In the triangular international between Scotland, England & Wales and Ireland at Fallowfield in Manchester on 17th July, Sinclair was third in the 1500 metres behind JJ Barry of Ireland and DG Wilson of England with the race won in 4:57.8. Into season 1948-49 and although the club was not evident in the results of the McAndrew Relay at the start of October, they won the South Western Relay from rivals Glenpark Harriers by 45 seconds. The names that were to make the club famous in the 1950’s were coming together – George King was second on the first stage just one second adrift of Irvine with Glenpark out of the first three. R Beaton of Wellpark dropped back as Glenpark swept into the lead on the second stageThen John Stevenson with the fastest lap of the day so far, handed his brother a six second lead over Glenpark. On the last leg “Though being chased by the young but unproved runner W Williamson (Glenpark) and the experienced internationalist , West Kilbride ‘flyer’ Jimmy Reid, Wellpark’s youth, T Stevenson, carried his colours well and actually returned the fastest time of the day (11:57).” Three Wellpark me were in the seven fastest times. In the preview of the National in 1949, Emmet Farrel said –“Frank Sinclair is trying with the idea of having a real crack at the mile in the coming track season, yet at the same time he would like to make the team for Dublin. Thus it is somewhat difficult to estimate his chances without knowing his present state of fitness and his intentions. Nevertheless I feel bound to put him on a short leet. Ayr Racecourse is made to measure for him and his easy loping stride and fast finish are a danger to the very best; and after all he was runner-up last year.” On 5th February at Kilmarnock, Tom Stevenson was second to McNab of Irvine YMCA in the South Western District Junior Championship. The team was seventh with George King second counter in eventh place followed by T Thomson, J Sinclair, David Anderson (who woukld become a useful marathon runner) and D Beaton. Although the team failed to close in at the National, Tom Stevenson finished fifth prompting Emmet Farrel to say, “Other features included the superb running of novices Tom McNeish of Irvine YMCA and Tom Stevenson of Greenock Wellpark. …. Tom Stevenson’s feat of finishing fifth is perhaps even more surprising (than that of McNeish) as the limelight was less focussed on him than on McNeish. Despite his tender years and slender build he ran with the aplomb of a veteran on this course which blighted the hopes of so many and tripped with fairy-like precision over the glaur.” Incidentally the course over which he was so effusive earlier was a different story in the country around the racecourse was laced with barbed wire fences and a burn which had to be crossed three times was in spate and everyone was soaked every time across: virtually all of the runners ended the day with scrapes. cuts or other wounds! Young brother John meanwhile, ran superbly well to be second in the Youths Championship behind G Adamson of West Kilbride. Tom was selected for the international and finished fifty third. Very little was heard of Greenock Wellpark Harriers during summer 1949, but they were out in the McAndrew Relay at the start of October that year when the team finished tenth. The runners were George King (16:44), R Beaton (17:55), John Stevenson (16:31) and Tom Stevenson (16:12). Not being involved in the Edinburgh to Glasgow, their last relay was the South Western District at West Kilbride on 5th November where they finished tenth after having won it the year before. The only two of that team were R Beaton on the first stage and Tom Stevenson on the last leg. Tom was second fastest with 13:42 to Gilbert Adamson’s 13:30. There was an even poorer turnout from the club in the South Western 7 miles championship at Paisley on 4th February when only Tom Stevenson and R Beaton turned out and they finished sixth. and twenty first. The question of where Frank Sinclair had gone was answered in Emmet Farrell’s preview of the National in 1950 when he listed F Sinclair of Blaydon and Greenock Wellpark. He was living in England and representing his English team south of the border. He also said that the previous year he did not even regard the ‘Greenock boy’ (Tom Stevenson) a threat in the National but he ran a really good race to finish fifth and make his selection certain. He said: “Tom Stevenson – A ‘Jack-in-the-Box’. Tom Stevenson (Greenock Wellpark) has just returned from the Army and though an international is still in the Junior class. He was a big surprise at last year’s National at Ayr. On a day that put paid to the chances of many favoured candidates, this slightly-built frail looking youth ran like a veteran to earn fifth place. Just when he is most overlooked he keeps popping up to make the critics sit up and take notice.” Tom opted to run in the Junior race but could only finish seventh in a race won by Adamson from Lennie of the Vale of Leven. There was no Wellpark team in the Senior race but …. the second finisher was Frank Sinclair, billed as Blaydon & Wellpark. Emmet’s report commented that “… Bobby Reid of Birchfield H. the winner dictated the pace of the race and a right merry one it was. Perhaps that is the reason why so many runners felt the pace so early in the race. A very fit Frank Sinclair loped along in close proximity and after a grad race was only 15 yards behind at the finish.” ‘The result and times were – 1. R Reid (50:22), 2. F Sinclair (50:25); 3. T Tracey (50:31); 4. JE Farrell (50:36). This gained Frank selection for the international in Boitsfort, Brussels and he was forty sixth to be the fourth Scot to finish. 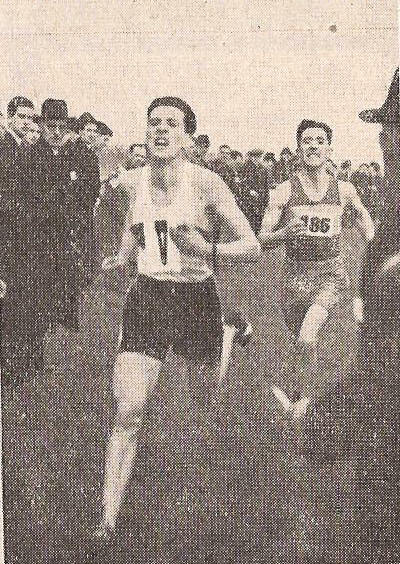 The outstanding form continued and in the SAAA Championsips at Hampden in June, the report reading “former holder Frank Sinclair outclassed his field in the mile and former junior champion Eddie Bannon had a good and exciting last lap to be runner-up.” The winning time was 4:23 with Bannon credited with 4:29.2. Frank followed this with another run in the triangular international at the White City in August and he was again first Scot when he was third behind the two English runners in a time of 3:56.8 for 1500m. The club again failed to get its best team out in the McAndrew Relay with their quartet of King, Lobban, Walker and Tom Stevenson finishing twenty first. They had a much better four out in the South Western District Relay where they finished third behind West Kilbride and Irvine YMCA. Team: T Walker (15:20); G King (14:12), T Stevenson (14:18), F Sinclair (14:12) Sinclair had third fastest time. 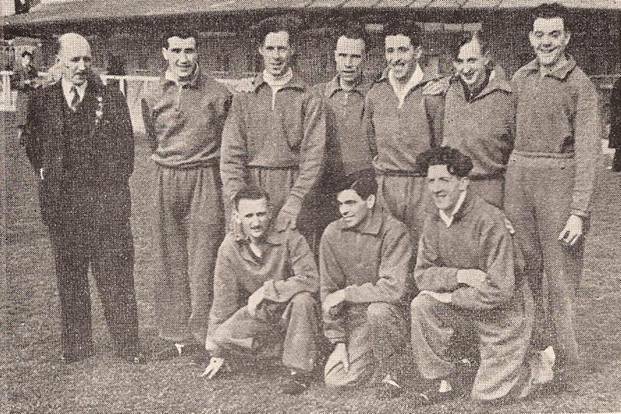 In his preview of the 1951 National, Emmet Farrell said ” a fit Frank Sinclair should be a certainty for international selection, in fact a contender for individual honours. But the mile champion does not at the moment of writing appear to be so fit as last year and unless he bridges the gap to a large extent he will be hard placed to gain a place.” However, it’s possible that Frank felt the same as Emmet because he was not a participant in the National. Come to that, none of the Wellpark seniors were on duty that day. 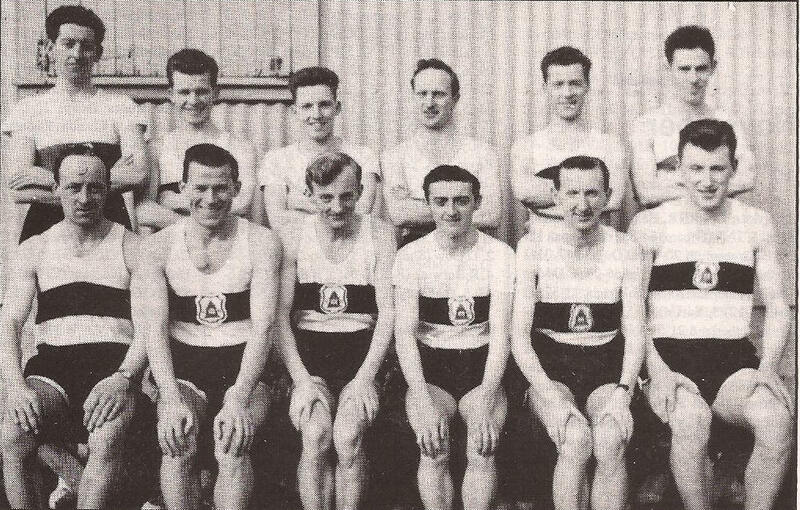 It still surprises me to see how many able athletes of the early 1950s missed the National – it is obvious with many clubs such as Vale of Leven that their top men avoided the cross-country championship of Scotland. It is the more surprising when you see that they were indeed good class runners over the country: in the South Western District Championships on 3rd February, Tom Stevenson was second in 34:22, just six seconds behind the winner. The club was third behind Glenpark (2nd) and Irvine YMCA (1st). The runners that day were T Stevenson (2), F Sinclair (4), G King (5), P McLaughlin ((22), R Beaton (35) and W Campbell (42). When it came to summer 1951, Emmet Farrell was quite confident that, if fit, was still his choice for the Mile. However the report the next month carried the news that Frank had not got through his Heat! When asked he apparently said that it was down to “lack of training.” However all was not lost for the Wellpark supporters – Tom Stevenson was second in 4:25 to Walter Lennie who had come up from Colchester for the event. Emmet’s ranking list for the year had John Stevenson ranked at number five in his top ten over the Mile although he was in fact the third ranked Scot on time. In the South Western District Cross-Country Relay at Ayr on 3rd November 1951, Wellpark was fifth of twelve clubs taking part with Tom Stevenson having the second fastest time just 9 seconds behind Alex Smith of Plebeian Harriers. The times recorded tell a story – G King 14:08, P McLaughlin 14:31, R Beaton 15:57 and Stevenson 13:26. Two and a half minutes between fastest and slowest team members. Into 1952 and the Nigel Barge Road Race on 5th January where Tom Stevenson was fourth behind Forbes, Binnie and Tracey (27 seconds behind the winner) leading the team of himself, brother John (9th) and George King (54th) into sixth of 17 teams. This prompted Emmet Farrell to comment “Another Singlet for Tom Stevenson? Three yeras ago when still a junior young Tom Stevenson of Greenock Wellpark represented Scotland at cross-country. Now just out of the junior ranks he has been showing grand form this season and this recent performance seems to suggest that he will be a live contender for international honours again in this his first season as a senior.” The next race thereafter was the South Western District Championships where Tom Stevenson won by over a minute from Harry Kennedy of Glenpark with George King third. The team did not figure in the top six clubs. Emmet’s forecast this time was for Tom to be fifth and for George King to be a contender. He was exactly right as far as Tom was concerned – fifth and a place in the team. But no GWH team in the race at all. He raced in the international and finished forty fifth. The only Wellpark Harrier running in the SAAA Championships was Tom and he failed to make the final but did get inside the standard time of 4:30. The actual time of 4:26 ranked him seventh in Scotland. At the start of season 1952-53 there was no Wellpark or Glenpark team at all in the McAndrew Relay at Scotstoun but on 18th October at Kilbarchan, Wellpark was second to Bellahouston – only 12 seconds down. The team of George King (15:03), David Anderson (16:15), T Stevenson (14:22) and J Stevenson (14:22) provided the first two times of the day. Looking forward to the National of 1953, Emmet Farrell as usual named his top six but added that he did not feel as confident as usual “the chief reason being the presence of Ian Binnie and the brothers Stevenson who have the ability if in the mood to upset the applecart.” He also noted them as possibles for the international team. In the South Western District Championship at West Kilbride on 31st January the club went one better than the year before. at the end of the first lap, A Napier, Paisley, had a lead of ten yards over T Stevenson with J Stevenson following close behind. When runners came into view again T Stevenson had taken the lead and crossed the line 100 yards ahead of his younger brother John with A Napier a further 15 yards behind.. The race ended in a tie between Wellpark and Irvine YMCA with a score of 102 points but the new rule gave Wellpark victory. “ The new rule stated that in the event of a tie, then the scoring would be done as though only the teams involved were competing. disregarding all other runners. The Wellpark team consisted of Tom and John Stevenson (1 and 2), F Sinclair (6th), G King (7th), P McLaughlin (36th), R Beaton 50th, with D McSwein a non-scoring runner. Almost the same squad turned out in the National with great results. The team was fourth and three men were selected for the Scottish team in the international! John Stevenson was third (behind Bannon and Forbes), Tom was fourth and Frank Sinclair won his fourth international vest in seventh place. The other team counters were George King (25th), R Beaton (88th) and Duncan McSwein (92nd). In the race itself, held in Vincennes, the two brothers had an unfortunate experience. John suffered from sunstroke and had a badly blistered foot which led to him dropping out while Tom in his third international, was also unhappy in the heatwave conditions. “Sinclair slogged with me well behind for most of the race then in the last lap went off like a 2-miler. Sinclair has the speed to be a very good cross-country runner if he would train for stamina and overcome his psychological fear of the early and middle stages of the race,” said Emmet who had himself run in the race – Frank was 52nd and Emmet 59th. This was Frank’s fourth and last international cross-country race. Both brothers were written up as track prospects but by 16th June only John was in the rankings with a 4:25.6 Mile time placing him seventh, and 14:51,3 for the Three Miles which also placed him seventh. Neither however featured at any distance in the National Championships. At the Glasgow Rangers Sports on 1st August John won the Handicap Two Miles off 150 from Len Eyre and Ian Binnie. The first real winter relay for the club in season 1953-54 was the South Western District event and they emerged triumphant at Kilmarnock on a day of torrential rain which made conditions very arduous. George King ran first and came in in ninth place, 200 yards behind the leader in 17:10. Frank Sinclair had a job to do and ‘he was using his long graceful stride of his to some purpose and with superb judgment brought Wellpark from ninth t a second position only 25 yards behind Beith’ John Stevenson, Wellpark’s second internationalist handed over a 120 yards lead to brother Tom (quoted as number three Scotland runner). I quote what happened next: it seemed to be all over bar the shouting but the tenacity of young Ian Harris, the 18 year old Beith boy, was good to see and when Tom injured himself at a fence the lead was rapidly cut down. Stevenson hung on however to record a victory of fifty yards for Wellpark. “ The day’s fastest times were from Frank Sinclair (16:00) and John Stevenson (16:16). John was second to Ian Binnie in the Nigel Barge Road Race at New Year. Emmet Farrell’s forecast for the National in 1954 he nominated John Stevenson – and as the man who could upset things if Bannon was below par. Tom he had down as one of those battling for the minor places. But first there was the matter of the South Western District Championships to be held in Beith. The report reads as follows, “This developed into another of those individual races dominated by the Stevenson brothers but on this occasion Tom the holder had to give way to young brother John who ran superbly throughout despite the treacherous underfoot conditions to win by over 150 yards from an admittedly much fresher older brother.” The team was well down on the year before, finishing fourth. The runners were John and Tom Stevenson (1st and 2nd), George King 7th, David Anderson (40th), R Beaton (41st), Duncan McSwein Jnr (47th) with RL McSwein being a non-scoring runner in 54th place. When it came to the national, there were two Wellpark men in the first eight – John Stevenson in sixth and Tom in eighth and the team finished in ninth place with George KIng 31st,David Anderson 116th, R Beaton 120th and Duncan McSwein 133rd. As expected John and Tom Stevenson earned selection but made rather heavy weather of it. Possibly the rather heavy conditions and lifeless nature of the turf handicapped them more than some of the others. John Stevenson in particular has the devastating speed of the miler but does not relish the heavy going.” In the international itself, John was 8th and Tom was 54th and a non-scoring member of the team. In the SAAA Championships at Hampden on 25th/26th June, Tom was fifth in the Three Miles in 14:42.7 while John was seventh in the same race in 14:54.1. The ranking lists published the day before the Championships took place indicated that John had run a mile in 4:22.9 (second fastest in Scotland) at Renfrew on 21st June, Two Miles in 9:12.9 (second) at Meadowbank on 19th June and Three Miles in 14:5.2 (second) at Ibrox on 12th June.. These were still his best times at the end of the summer, the only change being that his mile ranking went down to seventh. He remained the second quickest Two and Three Miler in the country behind Ian Binnie. In the South Western Championships on 29th January John Stevenson retained his title in what was described as convincing style from Lapsley of West Kilbride with brother Tom back in fourth place. George King was fifth and they won the team race by 40 points from Paisley Harriers. The remaining team members were D McConnachie 10th, J Cairns 12th and P McLaughlin 23rd. Non-counters were C Aitken 30th, W Aitken 34th, T Carr 38th and R Beaton 44th. Emmet’s top six for the 1955 National included John Stevenson at number five and again Tom Stevenson was reckoned to be a contender for one of the minor places. Well, he was nearly right. John was indeed second – but to Henson of Victoria Park rather than to Bannon of Shettleston – but brother Tom was fifth in 50:10 – forty seconds behind the winner and 34 behind his brother. The club team was fourth with the other runners being George King 24th, C Aithken 56th, J Cairns 63rd and W Stoddart 72nd and last counter. Two brothers in the Scottish team again, this time for the International in San Sebastian. Tom was 57th and John 60th – neither being a scoring runner. It was Tom’s fifth and John’s third appearance in the event and they had one more run in it each – in 1956. George King leading the Scottish Marathon from Joe McGhee, EddieKirkup (Rotherham) and Hugo Fox. I’ve no idea who put the ink numbers on the picture but they indicate the finishing positions. “By the time the Scottish marathon came round again, on 25th June, 1955, over the Falkirk to Edinburgh course, Joe McGhee was fitter than ever, ready to show that he was a worthy Empire Games champion, as well as supreme in Scotland. Emmet Farrell, himself sixth in 2:48:44, wrote that, ‘Joe McGhee’s record breaking 2:25:50 was easily the feat of the SAAA championships and puts him into world class and an extra glitter on to his British Empire gold medal. Conditions were excellent but the course is by no means an easy one, and this enhances the performances of George King (Greenock Wellpark Harriers) whose time of 2:34:30 beat the previous best ever in Scotland and that of Hugo Fox with a 2:37:35. George King had made his marathon debut the previous year, winning bronze despite a light training schedule of three days a week totalling 23 miles! Like most others at the time, he wore Green Flash tennis shoes, which were extremely heavy (especially when wet) but gave little protection. From March 1955, however, he increased his training load dramatically to over 80 miles per week! (Monday 14; Tuesday 5 + 10; Thursday 5 + 12 fartlek; Saturday 20; Sunday 15.) Not surprisingly he felt strong in the 1955 Championship! Later that year George won a one hour race at the famous Ibrox Sports covering 10 miles 1625 yards. Then he finished third in the Edinburgh Highland Games marathon to Eddie Kirkup of Rotherham and Jackie Mekler from South Africa.” This was not George’s last marathon by any means and he went on to win another SAAA medal and run well in road races all round Scotland. At the start of season 1955-56, Wellpark won the South Western District Relay Championship on 5th November by over two minutes from Paisley Harriers. George ran first and handed over a fifty yard lead to Danny McConnachie who increased the lead to about one hundred and sixty yards. John Stevenson increased the lead to three hundred yards and Tom Stevenson was approximately six hundred and fifty yards in front by the finish. Tom (16:19) and John (16:35) Stevenson had the fastest two laps of the day but an interesting feature of the first stage was that Wellpark’s second team was third, courtesy of W Stoddart (17:33). Stoddart had an identical time to McConnachie in the A Team for whom J Cairns had a faster time than two of the A team with his 17:11. A very good six in action there and the real relay – the Edinburgh to Glasgow eight man relay – was looming later in the month; and Wellpark were in the race for the first time. How would the new boys fare? W Stoddart ran on the important first stage – a poor run here would see the club too far back to do any damage but he ran a solid race to be twelfth. Tom Stevenson next on the ferociously difficult second leg against big guns from every other club – and he pulled up to fourth place with fourth fastest stage time – eight valuable places. J McGregor on the short third stage dropped a bit to seventh but most clubs put their weak man on this leg. George King ran on the fourth stage – another difficult one and maintained seventh with the sixth fastest stage time. On to the fifth leg and Danny McConnachie also held on to seventh place with eighth fastest time. The long and hard sixth stage was next with the best of the best in action – John Stevenson was the man and at the end of the stage they were still in seventh with fourth fastest time. He ran 34:16, just behind Alec McDougall of the Vale of Leven in 34:17, and one place in front of Adrian Jackson on 34:18! On the seventh stage, J Cairns held seventh with the fifth fastest time of the afternoon, and on the last leg C Aitken brought the team home in seventh with sixth quickest time. In many, if not most years, a team finishing seventh in their first run in the event would have won the medals for the most meritorious unplaced performance in the race but this time, the Vale of Leven won them after finishing a very good fifth. Nevertheless there was satisfaction in the performance and in the fact that they had six men in the first ten on their stages. they finished 2nd, 3rd and 4th in that order. The next big team race before the National was the South Western District Championship, held on 28th January at Beith. The individual race was won by Tom Stevenson (37:02) from John Stevenson (37:39) with Ian Harris of Beith third in 38:14. The team race was won by Wellpark with Tom and John 1st and 2nd, George King fifth, Bill Stoddart twelfth, C Aitken fifteenth and Danny McConnachie sixteenth, and the margin was 64 points – 51 to 115. Add in that the club’s Youth team was also first with A Cairns (2), I Ross (7) and J Melville (13) and it was clear that the entire club was in good shape. Emmet Farrell in his preview of the National estimated that John would be fifth and Tom seventh. He was nearly right in that they were both in the first seven all right but wrong in that they were further up than he thought. Bannon won in 46:55, Andy Brown was second in 47:06 with Tom Stevenson third in 47:30 and John fourth in 47:42. How did the team do? Well they did better than Emmet had forecast as well by finishing second! The wonderful team members who achieved the feat were – Tom and John in third and fourth, George King 21st, Bill Stoddart33rd, Danny McConnachie 43rd and P McKay 51st. Non Scoring runners included C Aitken, J Cairns, D McSwein, S Brown and W Aitken. The Stevensons continued the spirit of togetherness into the International where they finished 38th (John) and 39th (Tom) and counted as scoring members of the fourth placed Scottish team. It had been a wonderful period for the club with Frank Sinclair (4), John Stevenson (4) and Tom Stevenson (6) gaining fourteen cross-country international medals between them, Frank winning tow SAAA Mile titles plus a couple of minor place medals plus four runs for Scotland in the annual triangular match, plus George’s Marvellous Marathons and all the District and individual titles. The first run in the Edinburgh to Glasgow held out promise of good things to come but up to 1960 they were bedevilled by the lack of a first ten place on the first stage. When they finally got up to fourth in 1960 and in with a chance of the Most Meritorious Medals they went to Aberdeen who were in their first race for some time. Wellpark were most unlucky in the Most Meritorious Medal stakes -the following year they were seventh and the medals went to Dundee Hawkhill in 16th! The basic E-G Statistics for the period to 1960 are in the table. Frank Whitley was another top class athlete who eventually moved to London where he ran for Thames Valley Harriers and came back up to run in major races for the Wellpark. He had best times, ranked every year from 1962 to 1970,of 4:14.0 for the Mile (1969), 9:05.6 for Two Miles (1968), 14:09.9 for Three Miles (1968), 29:47.0 for Six Miles (1968), 14:25.6 for 5000m (1969), 30:24.6 for 10000m (1969) and 2:46:06 for the marathon (1969). Back to season 1956-57 though and the season started with the relays as usual. The club won the South Western District Relays with an almost brand new team – no Stevensons or Sinclairs therein! Junior McHenry ran the first stage in 14:04, P McConnachie and D McConnachie on second and third legs in exactly the same time of 14:12 and George King was timed at 13:41 for the last leg to seen the team win by over a minute from Paisley. The B Team of Cairns, Stoddart, Tom Stevenson and C Aitken was seventh with Cairns the fastest man in 14:20. Equal fastest laps were A Small of Plebeian Harriers and George King. The Edinburgh to Glasgow was held later that month, the result and runners are in the table above. In the District Championships, for the first time in many years there was no Wellpark runner in the first six in the race. They won the team race with C Aitken 9th, H McHenry 12th, R McConnachie 14th, I Ross 16th, G King 17th and J Stevenson 54th. Non scoring runners included J McGregor and D McConnachie. In the 1957 National, the top placed runner in the club team which finished ninth was P McConnachie who was thirty second with George King sixty fifth, C Aitken seventy first, T McKay eighty first, R McSwein 129th and S Brown 130th. D McSwein and C Aitken were non-scorers. H McHenry was sixteenth in the Junior Race. George King was still competing with distinction on the roads and when he ran in the Scottish Marathon on 22nd June from New Meadowbank it turned out to be even faster than that of two years earlier – Harry Fenion winning in 2:25:44 to break McGhee’s record by six seconds. Hugo Fox of Shettleston was second in 2:28:57 with George winning his third medal in four championships with 2:37:20. Although both district championships were won yet again, there were no Wellpark men in the international. Into season 1957-58 and the club won the South Western District Relay in November before tackling their third Edinburgh to Glasgow. After Aitken’s seventeenth place on the first stage it was a straight slog through the field with six of the remaining seven runners picking up a place and the other maintaining his position. After five consecutive victories, the club failed to retain the District Cross Country Championship in February 1958 with the honour going to Irvine YMCA. Beith was second and Wellpark third. In the National that year George King led the team home in 34th place with J McGregor (66), C Aitken (80), P McKay (94), F Whitley (121) and W Stoddart (130) the other counting runners. Some consolation was gained from the third place in the Junior Championships of H McHenry behind John Wright of Clydesdale and George Govan of Shettleston. Although the club continued to run well in 1958-59 and 1959-60 the best days of that excellent group of runners has passed. The high spot of 1958-59 was Tom Stevenson winning the South Western District title for the fourth time – if that total is added to the two won by John the brothers had won six championships in eight years and the club also won the championship six times in eight years! In the relays, there had been five consecutive victories and of course there were the second place medals in the national championships. There have been many very good runners since then – Frank Whitley and Bill Stoddart to name but two – but the club as a unit was not as successful as during this period. I had very interesting conversations with John Stevenson and Hugh Docherty. Hugh first: he joined the club in season 1949-50 and has held every position of note on the club committee as well as having run in the club colours for many years. He gave me a lot of information, some of which is included above, summarised here. Given the lack of any coverage of Wellpark’s men, other than George King, over the summer seasons, I first asked him where they trained and what the athletes ran in at that time of year and the he gave some information about individual athletes. “They ran mainly in track races but there was no track in Greenock at the time and they had to travel to the King George V Playing Fields in Renfrew if they wanted or needed to train on a cinder, measured running track. John Stevenson was allowed to train at Greenock Morton FC’s ground at Cappielow but there was no specific facility there. There was an old derelict railway station opposite the present Ravenscraig where they used to do sprints and then of course there was the Battery Park. It was good grass but not measured in any way at all. When a cinder track was finally laid at Ravenscraig they thought it was Paradise but it really wasn’t that good a facility and not looked after properly at all. John and Tom ran mainly on the track. Tommy did not have a lot of speed but he could hit his own top pace and hold it for a long time. At one time he ran in a Two Mile race and was well clear after the first mile and on schedule for the Scottish Two Mile record. But he slowed and ran in winning the event by a distance. When Hugh asked him about it several years later he replied that the track was very dusty and you were kicking up dust with every step – it got into your eyes, your mouth, your nostrils and when he saw how far he was in front he decided just to go for the win. John was basically faster and actually raced at the White City in London in a race won by Chris Brasher and John dead-heated with Freddie Green who had shared the World Three Mile Record of 13:33.2 with Chris Chataway. They ran in most major sports meetings such as the Rangers Sports and Glasgow Police Sports Meetings at Ibrox in Glasgow. Frank Whitley was a damn good runner! He was good at everything but he did not like the country, however after Tom and John got on to him about it, he ran in most events and ran well. He moved to England and even went to New Zealand later on. In 1968 he came up for the Edinburgh to Glasgow Relay and said that he was not too fit, and in consequence they gave him the third stage (the shortest in the race) where he ended up running the second fastest time of the day. His 22:00 minutes moved the club from twelfth to seventh and was only 5 seconds slower than T Coyle of Edinburgh Southern but 27 seconds faster than Tommy Patterson of Shettleston who was third fastest. When Frank Sinclair moved South and ran for Blaydon Harriers for a bit, it was because of his work as a draughtsman and not for the usual reason at the time of two years National Service. Hugh told me of a meeting at Dalmellington in Ayrshire when he was a Youth and he saw Frank surrounded by a group of youngsters in the changing room. He took them outside and when he came back in and was talking and laughing with Tommy he said that they had wanted his autograph. To the other Wellpark runners he was just a club member, but to others like these boys he was an accomplished athlete and must have been something of a hero for them to want his signature! Peter Connachie was the younger of the two brothers – he ‘had the heart of a lion’ and never ever gave up until he really had to – exemplified in a ten or twelve mile race against Andy Brown when he matched him stride for stride almost the entire distance, only falling away at the very end. Danny was also a very good runner and another who went to England for work. He kept running there but when he returned Peter, who was on the Committee, said that he was running well and fit, so they selected him for the A team for the next race where he did not run well. His own comment afterwards was that he was fit but not race fit as he had thought he was. John Cairns was another good man who did not get the coverage he deserved. In 1956 for instance he was one of the men who put the second team in the District Relays ahead of the first squad at the start of the event where Wellpark had first and third place medals. One of Hugh’s complaints was that the runners, at least at the start of the 50’s, failed to support the club in the National Championships as they should have done. At one point they ran mob-handed in the Nigel Barge but failed to materialise for the National Championship of Scotland. This was put right later on. (It is fair to point out though that this was not only a Wellpark Problem: other clubs were just as guilty as they were of not turning out their runners on the country at Hamilton. You only have to read the website club profiles of, for instance, Vale of Leven to see that.). That is a distillation of what Hugh told me but some is in the body of the text and there is more that might be added soon. John is a very interesting character in that he was a top notch cross-country runner who really should have been a track runner. Everyone said so but, not having a track to train on or a coach of any sort, he never really gave it his full attention. He usually ran in the Renfrewshire Championships at Moorcroft Park in Paisley or in the Three Miles at King George V Playing Fields track and in Two Mile Team Races which were a staple feature of the many Highland Gatherings or Sports Meetings. I spoke to him on the telephone and the following deals mainly with the only year that he ran properly on the track, 1954. “He was invited to run in a Great Britain team in Tourcoing in Northern France in 1954 but the other British runner failed to materialise so John was the sole GB representative in the 3000m. He knew it was less than eight laps, nobody he asked could tell him, he lost count of the laps so when some runners broke away from the field and then he heard the bell, he knew it was the last lap and gave chase knowing full well that you couldn’t give these runners a start over that distance. he finished fourth and Jack Crump, GB athletics supremo of the time, was pleased enough with that. When I asked John about his selection he said that it had come about after running in an Invitation Three Miles race at Hampden at half-time in a Scotland v England international fixture. The favoured runner was John Disley, better known as a steeple-chaser, and also in the field was Tommy Tracey of Springburn. It was his third race of the week. The Cross-Country International (!) had been the previous Saturday, then there was a mile at Ibrox the day before and then this Invitation Three Miles Race. It was a very windy day and John was actually leading going into the last lap, ahead of Disley, Tracey and the rest. He led into the wind down the back straight but the effort told on him and Disley passed at the end of the back straight and went on to win. It was after Crump saw this race that the invitation to Tourcoing came about. He must have impressed JC because there were a couple more races South of the Border against top class opposition. There was a Three Miles at the White City where he thought the first few laps were a bit of a doddle, then the race started and ended with the fastest last mile in a Three Miles event for sometime – he was down the field a bit but among some very good men indeed. He was also invited into another mile (possibly the Emsley Carr or its predecessor where he ran 4:10 and dead-heated with Freddie Green who shared the world Three Miles record with Chris Chataway a few weeks later. The time was good as was the 4:10.5 at Ibrox later that summer. A short limit Mile Handicap was held to help Len Eyre (England) and Ian Binnie (Scotland) get a good fast time for the distance. Off 50 yards, he was again in front going into the last lap and although Eyre passed him in the back straight, John came back at him to win. Although he was never coached, he was introduced to the Victoria Park coach at Ibrox after a race and they had an interesting chat that might, earlier in his career, have made a difference. When we spoke about other members of the club he said that Peter and Danny Connachie were both very good runners and Peter should have won the club championship over the country -there was always somebody else who was too good on the day. George King, for all his marathon running, was the same on the road and only won the club 5 miles road championship once. The man he spoke of most however was Bill Stoddart. He had never met anyone who trained like him for volume and mileage covered in training. Nobody else was so intent on winning races and he often did three training sessions in a day. He was very impressed by Bill and said that he had never met a more determined person. John answered the questionnaire – the questions were set for him and his replies are among the best that we have received because they illustrate several things: what the average Scottish club was like at the time, in his comments on the internationals he probably speaks for many Scots at the time who did not produce their ‘normal’ running abroad, and so on. Has any individual or group had a marked influence on your attitude or individual performance? Sadly the answer is no. There was no one to guide or advise me or my brother and training consisted of four haphazard sessions per week. What exactly did you get out of the sport? I enjoyed the “pack” runs with the rest of the boys over the hills and moors, appreciating the lovely countryside which exists in this area. What do you consider to be your best ever performance or performances? I created a record for the club 5 Mile Road Race in 1953. My time of 24 minutes 25 seconds stood for over 40 years and was never beaten. The course was changed a number of years ago because the volume of traffic was too heavy to ensure the safety of the runners. Although the old course was billed as five miles it was in fact longer than that. An accurate measurement of the course was made in the 1990’s which calculated the distance at 5 miles 120 yards but even that distance is less than when the record was set for the following reason: a number of years after the record was set, improvements were made to the road which involved taking away four large and winding bends and straightening the road. It was an out and return course so in effect there were eight bends to be taken nto account. I have calculated in what I believe to be a conservative basis that the additional distance is in excess of 5 miles added around 40 seconds to my time. Strangely this was the only race that I entered really determined to win. The club had won the Renfrewshire 4 x 2.5 miles cross-country relay earlier that year and Frank Sinclair recorded the fastest lap beating both Tommy’s time and mine. I was intent on winning the club’s 5 miles road race and from the gun I went into the lead and demolished both Tommy and Frank. I did 24:25, Tommy’s time was 25:19 and Frank’s 26:13. Frank ran precisely the same time that he recorded when setting the record in the 1940’s, which was subsequently broken by Tommy and then by me. … Your Worst? Although Tommy is now dead, and that still grieves me greatly, I will answer the question for both of us. I am referring to the International Cross-Country Championships. Neither of us ran a good race in any of these events, not even when we were a counting member of the team. I have deliberated on why this should have been and I believe the answer is quite simple. We were both jaded when the event came round and the reason for that is also simple. The club was absolutely dependent on our performances because for a long time the club did not have any depth in numbers. This meant that we both had to be as fit as possible at the beginning of the cross-country season at the end of September and continue that level of fitness through the various races until the Scottish Cross-Country Championship in February. This was a tall order bearing in mind that our training sessions were too few and our schedule inadequate for the task we faced. We had always managed to perform well enough in the Scottish Championships but after that it was a complete collapse. Perhaps if we had had a shorter period at trying to maintain peak fitness, this would have been to our benefit, but it was a non-starter as at heart we were committed team players. What ambitions did you have that were unfulfilled? Perhaps this area is my greatest failing as for some unexplainable reason I did not have any ambitions. In my later years I have come to regret this and I have often wondered how far I would have gone with proper application. In 1953 when I ran 3 miles in 14:05, this time was approximately 34 seconds outside the world record at that time. Would it have been possible to get nearer to the world’s best time with a coach,a running track on which to train and to have trained in a proper fashion? hat did you do away from running to relax? I enjoy ballroom dancing; lots of holidays with my wife in this country and abroad; I like quizzes on TV such as Mastermind, University Challenge and Eggheads: cannot stand any which involve pop music or celebrity culture. What did running bring you that you would not have wanted to miss? Made lasting friends; learned the importance of being a team player; I like being reasonably fit and I am sufficiently conceited to think that I am in better shape than most of my contemporaries. Can you give some idea of your training? Four sessions per week: Weekly mileage around 30 miles. Although I ran cross-country, my style was not suited to that discipline. I only ran once in a Scottish Track Championship race, in the 3 miles and I was slightly unwell on the day. It was the slowest 3 miles I ran that year (1954) by a long way. *British representative at an International 3000m event at Tourcoing in northern France in 1954. As I said, John’s replies are very informative for the present day athlete but were to some extent typical of the time. Very few clubs at the time had a coach which is not a situation that pertains in the twenty first century (although the coaching can be of a very variable standard! ), and the pack runs of which he speaks so fondly are almost entirely a thing of the past as had been lamented in many of the profiles on this website already. His reasons for the poor runs in the international I suspect have wider reference than simply for Tom and himself: there are frequent references to men having disappointing runs in the international in Emmet Farrell’s columns in the ‘Scots Athlete’ magazine and in Colin Shields’s exxcellent centenary history of the SCCU, ‘Whatever the Weather.’ John has provided an insight into his own career first and foremost but the light shed on the wider Scottish scene is also valuable.